Flash web design technology uses an innovative concept which helps in making your website impressive and customer oriented. Instead of using PowerPoint templates, you can use Flash design in creating your website to make a remarkable presentation of your concept by including graphics and sound. In addition to that, it involves the usage of flash animated logo designs which helps in promoting your business campaign. Want to make your website attractive so that your audience visits your website from time to time? Need help? 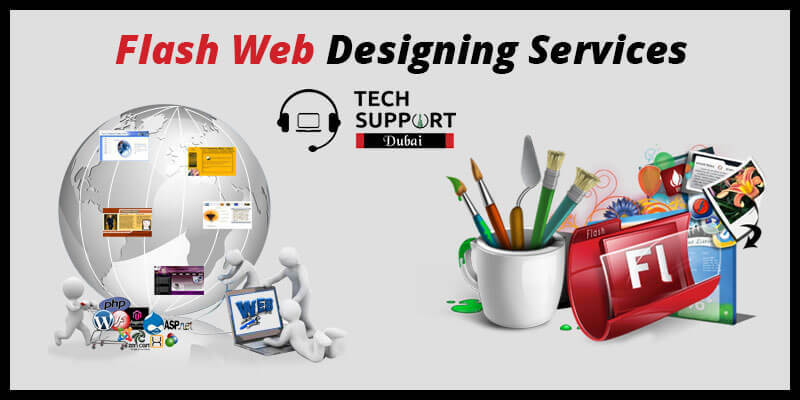 Contact our experts at Tech Support Dubai for best-in-class Flash web designing services. Want to implement advanced technology for promoting your website? Avail services for flash website designing in Dubai. Our team consists of skilled web designers who do not fail to provide you with professional website designs which not only attracts your online audience but also serves your purpose. You need not worry about the quality of our services as we have complete idea and expertise which helps you to excel in your field. Additionally, we use the finest resources to enhance your website. If you are searching for innovative technology, you can easily opt for Flash Web Designing Company in Dubai. Our experts at Tech Support Dubai are renowned for offering you with an attractive and functional website within a short period of time. According to us, success can be achieved through satisfied clients. In addition to that, we provide you with appropriate web-based solutions. You need not worry as you are in safe and skilled hands. The graphic designers of our team conducts research on the latest trends of web designing. We use the concept of flash header designs, flash banner or flash intro designs to give your website a wonderful outlook. Have faith in our services as we are aware of the ins and outs of flash website design. We value your money and hence we offer you with services at a reasonable rate. Our team helps in Flash designing your website in such a manner that it serves the purpose of your business promotion. Hence, it is essential for you to avail services for Flash website designing in Dubai from our experts at Tech Support Dubai. Reaching us involves simple steps. You can interact with us through phone calls, text messages, and emails. Contact us today to enjoy a premium web designing experience at an affordable rate. We also provide Dynamic web design service in Dubai.